Vet4Bulldog was founded by Dr. Roy Kraemer, a Tufts veterinary school graduate with over 20 years experience in the veterinary field. Dr. Kraemer is a well-recognized authority and is sought after by Bulldogs and French Bulldogs owners from all over the world for his medical and surgical expertise and Knowledge of the breed. 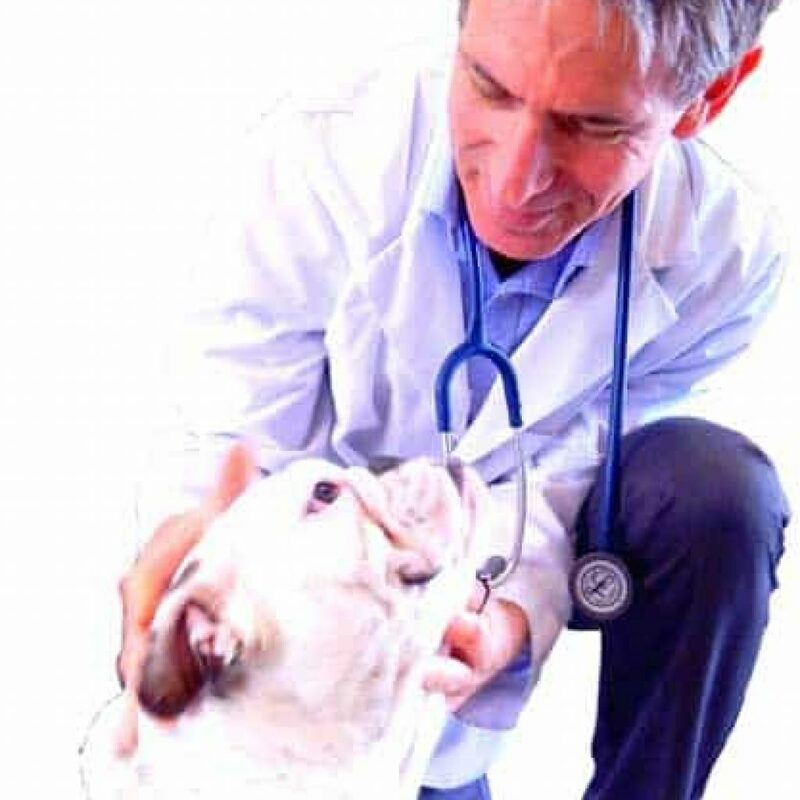 Dr. Kraemer serves the regional bulldog community as well as in-need rescued bulldogs, mostly under the love and care of the “Southern California Bulldog Rescue” (SCBR) at Vet4HealthyPet Advanced Medical Care located in southern California in the city of Orange. The centerpiece and the main focus of this site is “Bulldog & French Bulldog Maintenance“. Bulldog Maintenance is an authoritative guide for both the new and the seasoned bulldog owner. It is a “must-have toolbox” for the bulldog and French bulldog owners, it includes an exam-room like discussions about the most common breed associated medical and surgical conditions. It also includes the popular “Dr. Kraemer’s V4B Rule of Thumb”, and the must know “Dr. Kraemer’s V4B Tips & Warnings”. Topics discussed also includes images and videos from Dr. Kraemer’s daily practice. Last, for those of you seeking advice but unable to physically consult with Dr. Kraemer, we created a “Ask Dr. K / Q &A “ forum and a YouTube Vet4Bulldog channel with “How-To” videos and topical short seminars featuring Dr. Kraemer. Dr. Kraemer is also a pioneer in regenerative medicine and one of the few veterinarians that offer in-house same-day Stem Cell Therapy. He is a well known, leading provider of non-pharmaceutical healing therapies and alternative modalities for pain relief and healing including, Platelet Rich Plasma (PRP) Cryobanking, Laser Therapy and Pulse Electro Magnetic Therapy (PEMT). Dr. Kraemer’s V4B Joint & Bone Supplements can help prevent, slow down, and alleviate the arthritic and painful degenerative process, often the outcome of common orthopedic conditions such as ACL tears, Patella Luxation, and Elbow Dysplasia. Dr. Kraemer’s V4B Nose-Tail-Toe Antiseptic & Antifungal Skin Fold collection is the ideal skin fold care kit for the bulldog owner. Skin Fold Dermatitis in Bulldogs and French Bulldogs is an itchy and painful condition that requires daily nursing and care. Dr. Kraemer assembled a wide range, of unique skin and ear care products that includes V4B medicated rinses, lotions, gels, shampoos & conditioners that are custom formulated to the breed special needs. Dr. Kraemer’s V4B Affordable Bundles are selective popular economic kits that combine the most essential bulldog maintenance products at a reduced cost based on your ages or medical condition. Dr. Kraemer has a special interest in Bulldogs, French Bulldogs and other Brachycephalic breeds and their unique medical and surgical needs such as breathing and airway conditions, joints ligament and tendon injuries, ear canal disease, skin and allergy problems, eye and eyelid abnormalities, as well as other medical conditions related to the bulldog breed. Dr. Kraemer is also a leader in regenerative medicine and the founder of StemCell4Pet.com. He has been collaborating with authoritative researchers in the field on both the human and veterinary sides. Dr. Kraemer offers alternative non-pharmaceutical therapies for pain relief, wound repair, and inflammatory conditions in the form of cutting edge healing modalities. His hospital provides advanced and comprehensive medical and surgical services that include wellness and preventative care, dental services and dental radiology, general surgery, bulldog specialty surgeries, orthopedic surgery, ear canal surgery, radiology, cardiology and ultrasonography. Dr. Kraemer and his Vet4HealthyPet team work closely with the non for profit Southern California Bulldog Rescue (SCBR), providing their dogs with shelter, medical and surgical services. Review of the medical record. A demonstration of all the weekly Bully “must do” critical maintenance routines. Ask Dr. Kraemer a question regarding your English and French Bulldog and we will get back to you as soon as possible. This review is long overdue. Dr. Kramer helped our bully so much with his skin. Alot of the products he sells are his own but they work! He knows what triggers most bullies and has so much experience it's insane. Our crazy itchy bulldog was so peaceful after seeing Dr. Kraemer. It's been awhile since we have taken him in but our dog will only be returning to Vet4Bulldog. Dr. Kraemer and his staff are beyond fantastic. Our sweet Frenchie Daisy had some GI problems when she was very young. We tried everything and could not find a solution. We found Dr. Kraemer and he was able to get us on the right track within a matter of weeks. We are so thankful for his services and take our girl there for all of her health needs. THEE BEST vet you will find for bulldog breeds. Dr. Kraemer is so kind, patient, thorough, and knowledgeable. His staff is super sweet and extra caring! I have a french bulldog puppy and I've been to other vets that weren't able to answer certain questions about the breed or pinpoint problems. Dr. Kraemer blew me away. He was able to answer my questions without me having to ask and by just LOOKING at my pup for some things. He made sure I was conformable with all treatments and medications, offering me alternatives if I wasn't sure about something. I recommend Vet4Bulldog to any pet owner looking for a vet and staff who truly care about your pup and the work they are doing.